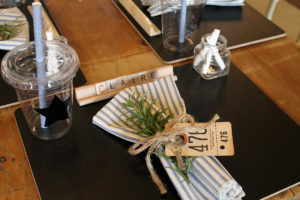 If you did see anything on Instagram, you may remember that Claire chose a FIXER UPPER theme party to celebrate her birthday. 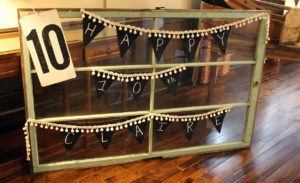 I know that seems an odd theme for a party, but she absolutely loves the Fixer Upper TV show. She even wanted me to invite Chip and Joanna to her party! This theme definitely challenged me! 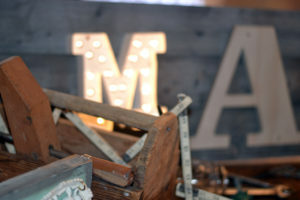 I kept in mind Joanna’s simple farmhouse style as I planned the decor for the party, and I mixed in some elements of building supplies. 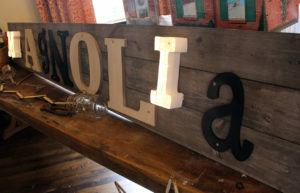 In keeping with the Fixer Upper style, I created a sign out of shiplap (yes, shiplap!) 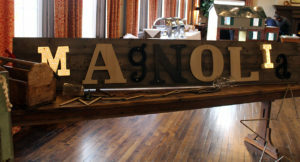 saying “Magnolia” that greeted the guests when they arrived. 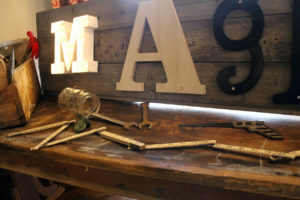 The sign was displayed on a rustic farmhouse table, along with some antique tools and a vintage metal dollhouse. 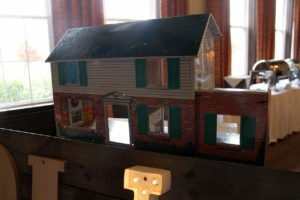 That dollhouse truly looked like a fixer upper! 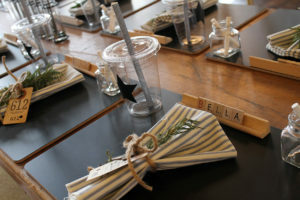 My favorite part of decorating for the party had to be the table where the girls sat and enjoyed a lunch of mac ‘n cheese, mini Texas toast pizzas, BBQ pulled pork sliders, and fruit. 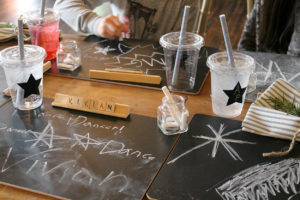 The farmhouse table was set with chalkboard placemats at each place setting, along with a small glass container of chalk that the girls used to draw while eating and chatting with their friends. Gold chiavari chairs added an elegant touch to the rustic style. 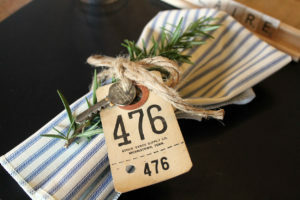 I used blue ticking fabric for napkins, and I adorned them with sprigs of rosemary, vintage house keys, and antique cattle auction tags. 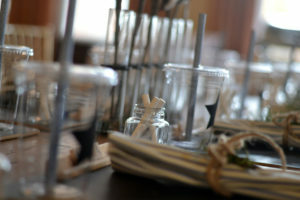 It was all tied around the napkins using jute string. 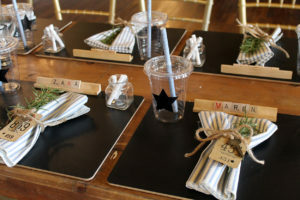 Plastic cups were accented with Texas star chalkboard labels, providing the girls another place to draw or write their names. 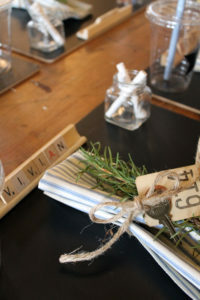 Place cards were created for each guest using vintage scrabble tiles to spell out their name. These tiles were glued to wood trays, allowing the girls to take them home at the end of the party. 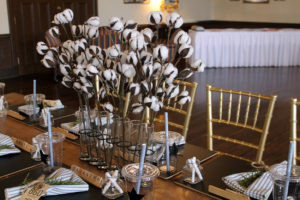 The centerpiece was a set of cylinder vases filled with cotton stems. 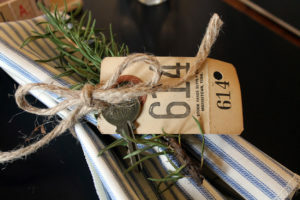 How simple and how very Joanna! 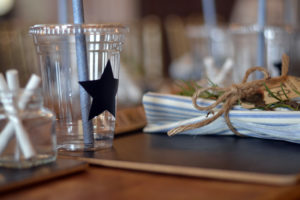 While I enjoyed decorating for the Fixer Upper party, I had just as much fun coming up with ideas for activities…which I’ll be sharing tomorrow. Be sure to check back on Thursday for details on Chip’s favorite day, Demo Day! Well, you certainly rose to the challenge! Looking forward to reading more tomorrow.